On this page, you will find lots of information about our veils, and veils in general. Information we have listed includes how to wear a veil, correct positioning of veils, care instructions for veils, veil edges and accents, veil colours and fabrics, and instructions on how to detach layers from chapel and cathedral length veils. There are basically three ways you can wear a veil: high on your head, towards the back of your head, or low at the back under an up-do. Most veils are designed to be worn in one of these ways, so wearing it in a different way may alter its look. The comb must be pointing downwards with all veils. As a general rule of thumb, the fuller the veil, the higher on the head it should be worn. A very full veil should be worn high up on your head, and usually with an up hairstyle, so that the veil is well anchored in your hair. This will produce a very full, princess look, which looks heavenly. A veil which has medium fullness can also be worn high up on your head, which will give you a toned down, full look. Also the more layers, or tiers, your veil has, the fuller it will be. A veil with medium fullness looks great when worn towards the back of the head. This can be with an up or down hairstyle. Single tier veils look great with a down hairstyle, and worn towards the back of the head. This is also a good position to wear a two tier veil with medium fullness, with your hair in an up-do. 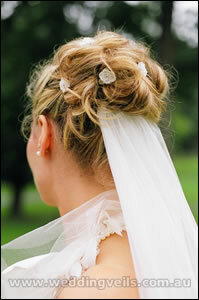 A veil with subtle fullness or a single tier veil can be worn in this position, tucked under an up-do. In this position, the veil looks sleek and stylish. This is a popular choice for less formal weddings, or if you don’t plan to wear your veil over your face. 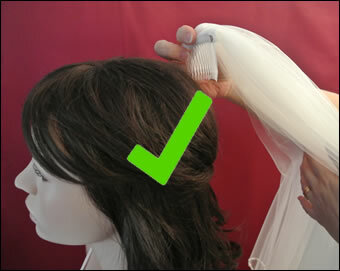 Hold the veil with the longest layer against your back, and shorter tier (if any) on the outside. 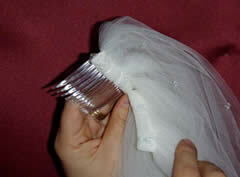 Then turn the comb downwards and tuck it into your hair, so that the veil is well anchored (see second photo below). The fabric should come up and over the comb, giving you a beautiful bridal look when the veil is in your hair. 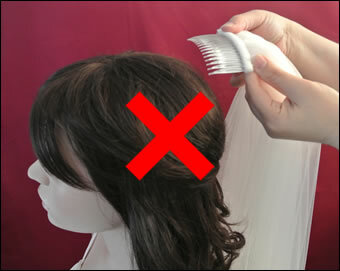 If you push the comb forward or upwards into your hair (as shown in first photo) instead of downwards, the veil will be the wrong way around. Usually your hairdresser should be able to help with positioning your veil, after you have had your hair done. Remember that the look of the veil changes depending on where on the head your veil is placed. For instance, wearing it close to the top of your head will give you a fuller look, and it will also tend to fall in front of your face. Wearing it further at the back of the head, particularly under your hairdo, will give you a slimmer, more streamlined look. Some veils are designed to be worn in a particular way. If you’re unsure about the best way to wear your veil, please email me and ask! your hair, the tiers will be the wrong way around. downwards. Push the comb down into the hair this way. The tiers will be the right way up. Veils which have a detachable longer tier have the comb sewn on to the shorter tier. This enables the long tier to be removed, allowing you to change your look, or just wear the shorter top tier on its own. The veil needs to be positioned in your hair with the comb pointing downwards, as shown in the left photo below. See also Correct Positioning of Veils (above). There are snaps sewn at the top edge of the two tiers. To remove the long tier, simply undo the snaps which hold the two layers together, as shown in the right photo below. There is no need to take the entire veil out of your hair to do this. With the help of a friend, it can be done while the veil is still in your hair, so your hairstyle stays put. Plain: A plain edge has no finishing edging at all (also known as a cut edge). This is a very subtle edge. Pencil: A pencil edge is a stitched edge, which is thin and softly ruffled. Satin edge 6mm: Satin bias binding is flat and looks very elegant. 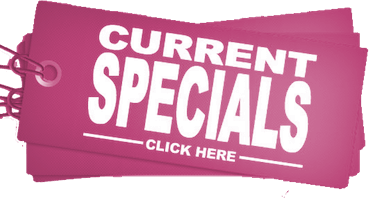 Also available as 3mm satin edge, which is a double faced satin ribbon. Russia Braid: The Russia braid edge is similar to a corded or piped edge, and is 3mm wide. Also known as Soutache edge. Organza ribbon: The organza ribbon has silver edges, and has a sheen to it. Lace: We have many lace edgings available. See the Lace Edgings section below. Beaded: Crystal beaded edge, using Swarovski AB crystals. We have several different beaded edges available. These are the lace edgings we have available for our Mantilla veils. We have these in stock, unless otherwise specified. These laces can be used on most of our Mantilla veil designs. Your veil will be steamed and pressed before it is packaged to be sent to you. However there may be some small creases which have formed during transit. Don’t worry! They are easily removable. The first thing to try is to place your veil in the bathroom while having a shower (hang it on the bathroom door, for example) as the steam from the shower can help the creases to fall out. If you own a steam iron, you can steam the veil with jets of steam which are released when the steam button is pressed. Use only the steam released, and do not press or iron the veil at all. Please note, this is not the same as a standard iron, which will not do the same job, and may actually damage the veil. Hold the veil over the steam of a boiling kettle. The hot steam should get rid of any remaining creases. Just let it hang! 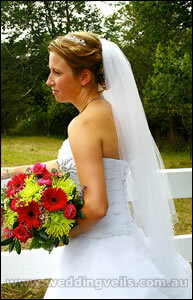 By leaving your veil hanging, rather than folded up in a box or cupboard, most creases will just fall out on their own. Please note: We do not recommend dry cleaning veils. Due to their delicate nature, dry cleaning can cause damage to veils. These are the veil colours we have available. You can request sample swatches to check with your dress. Please advise the colour of your dress and which fabrics you would like to see. We use the finest quality tulles for our veils including Bridal tulle, Supersoft tulle, Glamour tulle and Superfine tulle. Different tulles are used for different veils. We also use silk chiffon for some of our veil designs. 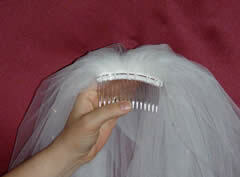 Bridal tulle is our standard tulle which is used for most of our veils. It’s also known as Bridal illusion. This tulle is very sheer and light. It has medium softness and is most suitable for veils with more volume or fullness, as it holds the fuller shape well. Some of our veils which are made from Bridal tulle include Allure, Abigail, Elegance and our mantilla veils. Supersoft tulle is soft and fine, and closely resembles silk tulle. It has a very soft handle and flows beautifully. It is a narrow fabric thus veils made from Supersoft tulle are slim. Used for the Dynasty veil. Glamour tulle is soft and light, with a hint of shimmer through it. It is a narrow fabric (140cm) and suits slim veils. Used for the Paris veil. Superfine tulle is soft and light but with no shimmer. Falls softly. Used for the Maya veil.